Hohmann Builders began as a small framing company in 1983. 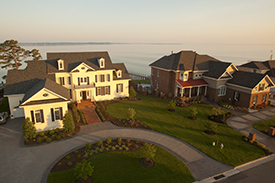 Since those early days, it has grown into a custom homebuilder known for their quality workmanship, attention to detail and customer relations. They have built their reputation by taking pride in their craftsmanship, using only the finest materials and being available for their clients even long after their homes are complete. Russ Hohmann has been a Featured Builder in Gatling Pointe, Graystone at Eagle Harbor, Founders Pointe, and The Riverfront.